Cisco Systems' point man on the Internet of Things (IoT) has resigned just as industries start to explore how millions of sensors and devices can be connected over networks. Cisco confirmed on Thursday that Guido Jouret, who was vice president and general manager of the company's Internet of Things Group, has left to "pursue a new opportunity." Rob Soderbery, senior vice president of Cisco's Enterprise Networking Group, which oversees the IoT division, will now oversee it directly, Cisco said. Jouret's departure, reported earlier by blogger Brad Reese, comes as IoT starts to generate the kind of engineering and venture capital interest that could lead to a startup boom, said Infonetics Research analyst Godfrey Chua. Jouret may well be leaving to join one of those startups, Chua said. IoT could be a hugely important trend for Cisco in the coming years, as the networking juggernaut is well aware. It estimates that IoT and business intelligence related to it -- what Cisco calls the Internet of Everything -- will generate US$19 trillion in value over the next 10 years. Cisco wants to be viewed as a leader in the category, and with good reason, as it already sells the most gear for existing networks. Cisco's made most of its money selling network gear any enterprise can use, Chua said. Voice, video and data networks based on IP (Internet Protocol) are pretty much the same across all industries. But they're also largely built out and are offered by a slew of less expensive competitors, Chua said. IoT means more endpoints to connect and fatter pipes to carry their data, but it also means deciphering the needs of a lot of specialized and often highly regulated markets, he said. While Cisco has been braver in taking on that challenge than some rivals, such as Huawei Technologies, enterprises now want to know how the vision of IoT is going to become real, Chua said. "I think there's an impatience in the market in terms of getting answers from Cisco," he said. 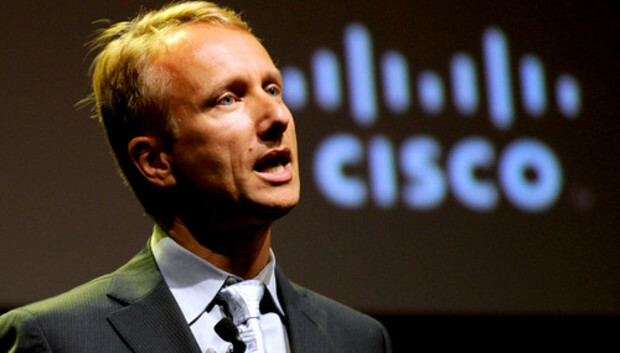 Jouret has led Cisco's development of products specifically for IoT. Those efforts include tackling the challenges of connecting large numbers of new devices, such as cameras, environmental sensors, ventilation systems, cars and electric meters. Earlier this year, Cisco applied its router technology to the problem, introducing hardened outdoor routers with Linux built in to handle some processing at the remote edge of wireless networks. Under Jouret's leadership, the company has also joined industry groups trying to standardize the technologies used in IoT for greater scale and interoperability, and later this year it will host its second annual IoT World Forum conference in Chicago. Despite the broad potential for new types of connected devices and collected data, IoT suffers from an identity problem in some industries, where the value of IoT may be recognizable but its name is obscure. Quotes of the week: "It's cheating and doesn't sit well."